Low Intensity ID Rate is the percentage of the least intense MS1 peaks that get identified as a peptide. The Low Intensity ID Rate measures the efficiency of sampling and detection amongst the lowest intensity signals. 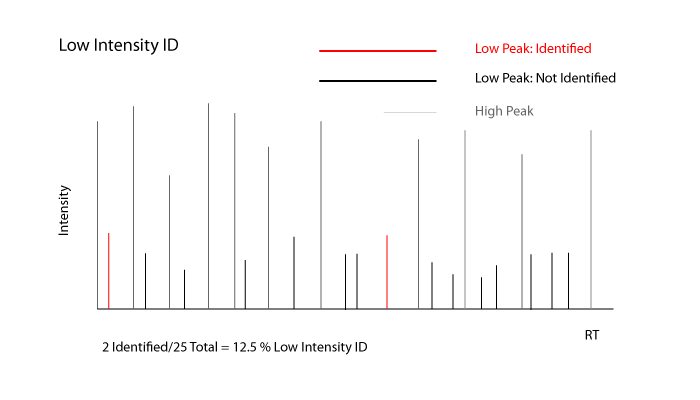 The Low Intensity ID Rate is calculated from only the least intense MS1 peaks. The least intense peaks are the lowest 25% ranked by the MS1 maximum intensity. The metric is the percentage of these low strength peaks that the search engine matches to a peptide. The Low Intensity ID Rate tells what fraction of peaks with weaker signals are matched to peptides. If this metric is unusually low, that may mean that the mass spectrometer has lost sensitivity. Whereas the Low Intensity ID Rate measures how efficiently the low intensity MS1 ions are matched to peptides, the High Intensity ID Rate does the same thing for the high intensity MS1 ions. In general the Low Intensity ID Rate is expected to be smaller than the High Intensity ID Rate and it is worth investigating if it is not.